Applying pre-bonded extension along with your natural can help to make it look long and voluminous. There are various hair extensions that can be purchased and it can be used to style the hair as usual, but they can damage the hair. So people prefer pre-bonded extension that is known to prevent the hair from getting damaged. To start the styling, take the natural hair and keep it separated on top of the head. Then pull out a thin hair strand near the nape of hairline and comb it gently. Try to pull out small hair from the hair extension from the holes and wrap a pre-bonded extension to your natural hair strands that comes out of your template. Use the fusion connector iron and clamp it over your wrapped hair and make sure to leave it for about 4-5 seconds before taking it out of your hair. Use the same method on the remaining hair parts and take template from the bonded part in your pre-bonded extension for brushing it gently only after it becomes completely dry. Pull out another thin strand from your hair from behind the head and use same technique over this section as well. Try to use your template by simply attaching it with the pre-bonded extension. At last make sure to comb your hair to make it free from knots and style it as you wish. Most of the people want to make their hair straight, but they will be afraid to use the hairstyling tools. There are also few simple things that can be followed to make the hair straight with getting into a professional way. You can also consult a hairstylist before making the hair straight. Make sure that the hair has been fully washed before you start the styling process. First apply a hair conditioner on a clean hair and purchase the conditioner that is used while making the hair straight. Then rinse the hair and dry it with a towel than using a blow dryer. Once the hair becomes slightly damp, now you can use the blow dryer to prevent the frizzy look in your hair. Next apply small amount of hair serum as it can prevent the hair from getting damaged. Start combing your hair completely from the root and move till the hair ends which will spread the serum through the hair. Use the blow dryer along with straightening nozzle on your hair all over in various directions. Now keep the hair section secured and take another section to use the same technique. Move the blow dryer about 90 degree angle over the hair section and brush it straight from top to bottom. Continue the same method all over the hair in sections using the blow dryer to end the straightening process. Making the straight hair to grow lengthy is not so easy, as it can cause breakage. You must follow a proper method to achieve a long looking straight hair. It is important to maintain the hair in a proper when you are planning to make the hair to grow long. The straight hair will be fragile as it has undergone chemical process which can lead to easy breakage. So making them grow long will be difficult for most of the people. Always wash your hair using only the moisturizing shampoo. You must apply this shampoo over your head and try to massage it gently in your scalp along with the hair. Use cold water for rinsing your hair to grow the hair moisturized. Try to condition your hair once it has been washed with a shampoo. Moisturizing conditioner can be a perfect choice for a newly grown hair. Leave the conditioner over your hair for just five minutes before rinsing it with normal water. You must always comb the hair using wide-tooth hair brush to take the tangles out and try to brush it from the end before moving towards the root of your hair. Get a haircut at least once in a month by going to a hairstylist as it can make the hair grow as fast as possible. Try creating a braid with your hair when it is still wet and after the hair becomes fully dry, brush it completely. Avril Lavigne is wearing a straight emo hairstyle is knonw to be a different way of styling your hair. 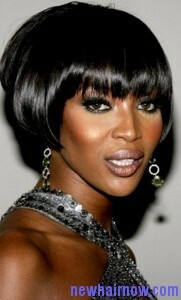 This style will be usually layered and then cut in uneven lengths or shaped inward. There are many celebrities who like to wear this style as it can give them look a really attractive. This style is one of the best and most recognizable aspects of an emo style and there are several ways which can be followed to achieve this hairstyle. 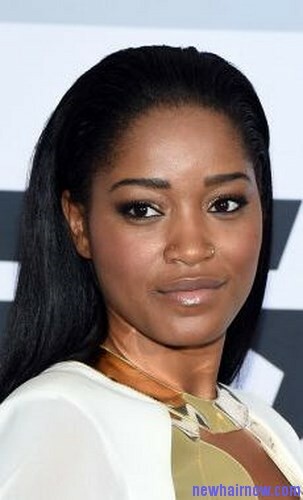 Those who have short and worn one side of the face, the emo hair will have few distinct styles which will be worn by emo people. A straight emo style will have long as well as asymmetrical bangs which will be swept to a side which can give attention to your eyes. It will look particularly flattering for individuals who have long faces because it can help to get a more oval face shape. This hairstyle will also lend itself to the bright as well as bold highlights that are usually popular in the emo fashion. Most of the people who like to wear this type of hairstyle may also try to add hair accessories like small bows and clips to get more interesting look. It is very easy to get this hairstyle, but to make it look more perfect try to get help from an hairstylist and also create long emo hair with few bangs or strands of hair. Aloe Vera hair gel is the natural hairstyling product for using it on the straight hair. There are also other products for using it on the straightened hair, but they can be much costly. Aloe Vera has been used by most of the people for treating their skin from a long time, but it can also be helpful while treating the straight hair. First option is using aloe Vera hair gel and apply it gently over the scalp on daily basis before going to bed. You can also take 1 tbsp aloe Vera hair gel and mix it with the shampoo for washing the hair. Then add 1 tbsp aloe Vera hair gel into the conditioner for applying it over your hair to maintain the moisture in it. Another option is take little amount of aloe Vera hair gel in your hands and spread it over the entire hair from top to end to make it look shiny. Aloe Vera hair gel can also be applied over the hair ends that look dry as it can prevent the hair from getting damaged. You can also make deep conditioner with the help of aloe Vera hair gel by mixing it with olive oil. Try to apply this mixture over the hair completely and brush it using a wide tooth hair brush. Wash the hair after half an hour to achieve the best result. High quiff ponytail is a new version of the standard pompadour hairstyle that is possible to be worn by both the genders from a long time. 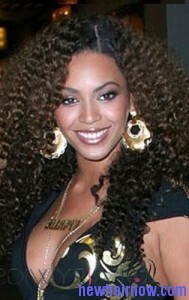 In this hairstyle, there will be a back-combed puffy crown along with a straight ponytail positioned mid-head. To achieve this hairstyle, you must make sure that the length of the hair medium to long or add an extension to your hair to make it long enough to start the styling process. This hairstyle is a perfect choice only for a formal occasion. Start the process by blowing your hair to dry which will make straight hair into a curly looking hair will not look perfect for this hairstyle. Collect the front part of the hair from temple to temple and secure it out of the way. 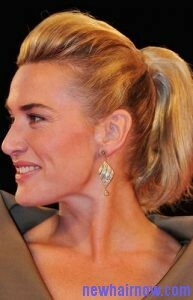 Take the sides of your hair back off the face and keep the hair as smooth as possible to create a ponytail. Next backcomb the top section of the hair and spritz all over the hair with a hairspray. Smooth the outer surface of the hair with a paddle brush and take it back to the crown by pushing it forward to create a quiff. The hair may get tangled, so try to be careful during this process. 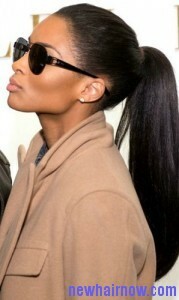 Wrap the ends which are hanging down your back at the base of the ponytail. Smooth back all of the hair and mist all over the hair with a finishing hairspray to get the desired effect. Having a thick hair can be difficult to style in different ways for most of the people. In case the hair is short you may have to struggle for keeping the hair straight. There are ways that can help for keeping your hair straight without using any special hair products. You can use a normal straightening iron on a medium to long hair, for using it on short hair try to purchase thin hair straightening iron. The following method can be challenging for those who are straightening their hair for the first time. First clean the entire hair by just washing it as usual and follow with a deep conditioning process. The conditioning process is very important in this method as it can make the hair straightening very easy with the thick hair. Now brush the hair from top to bottom and take the hair sections outside. Then use the blow dryer on each of the hair section. Make few small sections in your hair and keep it secured individually. Take the hair straightening iron with medium heat and clap it with each section of your hair. Make sure to use the straightening iron on one section at a time. You can slightly increase the heat produced by the straightening iron in case the hair fails to become straight or use the straightening iron at least two times with medium heat to make the hair straight.